The commented ellipses above indicate that the case int constants continue incrementing by 1, so there are really 19 cases in the above code snippet. Since I wasn't sure whether I would actually need all the powers of 10 in case statements 10 thru 18, I ran some microbenchmarks comparing the time to complete 10 million operations with this switch statement versus a switch with only cases 0 thru 9 (with the exponent limited to 9 or less to avoid breaking the pared-down switch). I got the rather surprising (to me, at least!) 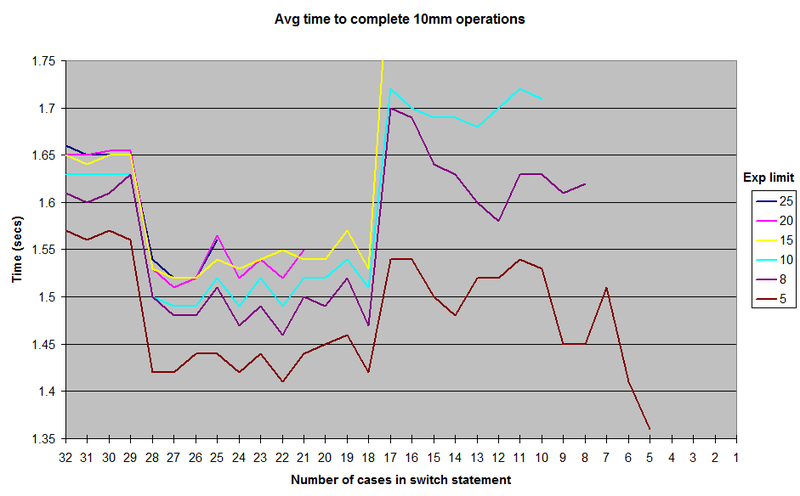 result that the longer switch with more case statements actually ran faster. On a lark, I tried adding even more cases which just returned dummy values, and found that I could get the switch to run even faster with around 22-27 declared cases (even though those dummy cases are never actually hit while the code is running). (Again, cases were added in a contiguous fashion by incrementing the prior case constant by 1.) These execution time differences are not very significant: for a random exponent between 0 and 10, the dummy padded switch statement finishes 10 million executions in 1.49 secs versus 1.54 secs for the unpadded version, for a grand total savings of 5ns per execution. So, not the kind of thing that makes obsessing over padding out a switch statement worth the effort from an optimization standpoint. But I still just find it curious and counter-intuitive that a switch doesn't become slower (or perhaps at best maintain constant O(1) time) to execute as more cases are added to it. These are the results I obtained from running with various limits on the randomly-generated exponent values. I didn't include the results all the way down to 1 for the exponent limit, but the general shape of the curve remains the same, with a ridge around the 12-17 case mark, and a valley between 18-28. All tests were run in JUnitBenchmarks using shared containers for the random values to ensure identical testing inputs. I also ran the tests both in order from longest switch statement to shortest, and vice-versa, to try and eliminate the possibility of ordering-related test problems. I've put my testing code up on a github repo if anyone wants to try to reproduce these results. So, what's going on here? Some vagaries of my architecture or micro-benchmark construction? Or is the Java switch really a little faster to execute in the 18 to 28 case range than it is from 11 up to 17? UPDATE: I cleaned up the benchmarking library quite a bit and added a text file in /results with some output across a wider range of possible exponent values. I also added an option in the testing code not to throw an Exception from default, but this doesn't appear to affect the results. UPDATE 2: Found some pretty good discussion of this issue from back in 2009 on the xkcd forum here: http://forums.xkcd.com/viewtopic.php?f=11&t=33524. The OP's discussion of using Array.binarySearch() gave me the idea for a simple array-based implementation of the exponentiation pattern above. There's no need for the binary search since I know what the entries in the array are. It appears to run about 3 times faster than using switch, obviously at the expense of some of the control flow that switch affords. That code has been added to the github repo also. As pointed out by the other answer, because the case values are contiguous (as opposed to sparse), the generated bytecode for your various tests uses a switch table (bytecode instruction tableswitch). However, once the JIT starts its job and compiles the bytecode into assembly, the tableswitch instruction does not always result in an array of pointers: sometimes the switch table is transformed into what looks like a lookupswitch (similar to an if/else if structure). Decompiling the assembly generated by the JIT (hotspot JDK 1.7) shows that it uses a succession of if/else if when there are 17 cases or less, an array of pointers when there are more than 18 (more efficient). The reason why this magic number of 18 is used seems to come down to the default value of the MinJumpTableSize JVM flag (around line 352 in the code). I have raised the issue on the hotspot compiler list and it seems to be a legacy of past testing. Note that this default value has been removed in JDK 8 after more benchmarking was performed. Finally, when the method becomes too long (> 25 cases in my tests), it is in not inlined any longer with the default JVM settings - that is the likeliest cause for the drop in performance at that point. Switch - case is faster if the case values are placed in a narrow range Eg. Because, in this case the compiler can avoid performing a comparison for every case leg in the switch statement. The compiler make a jump table which contains addresses of the actions to be taken on different legs. The value on which the switch is being performed is manipulated to convert it into an index in to the jump table. In this implementation , the time taken in the switch statement is much less than the time taken in an equivalent if-else-if statement cascade. Also the time taken in the switch statement is independent of the number of case legs in the switch statement. As stated in wikipedia about switch statement in Compilation section. If the range of input values is identifiably 'small' and has only a few gaps, some compilers that incorporate an optimizer may actually implement the switch statement as a branch table or an array of indexed function pointers instead of a lengthy series of conditional instructions. This allows the switch statement to determine instantly what branch to execute without having to go through a list of comparisons. In the first case, with narrow ranges, the compiled bytecode uses a tableswitch. In the second case, the compiled bytecode uses a lookupswitch. In tableswitch, the integer value on the top of the stack is used to index into the table, to find the branch/jump target. This jump/branch is then performed immediately. Hence, this is an O(1) operation. A lookupswitch is more complicated. In this case, the integer value needs to be compared against all the keys in the table until the correct key is found. After the key is found, the branch/jump target (that this key is mapped to) is used for the jump. The table that is used in lookupswitch is sorted and a binary-search algorithm can be used to find the correct key. Performance for a binary search is O(log n), and the entire process is also O(log n), because the jump is still O(1). So the reason the performance is lower in the case of sparse ranges is that the correct key must first be looked up because you cannot index into the table directly. So the compiler basically creates this huge table containing dummy entries between the gaps, pointing to the branch target of the default instruction. Even if there isn't a default, it will contain entries pointing to the instruction after the switch block. I did some basic tests, and I found that if the gap between the last index and the previous one (9) is greater than 35, it uses a lookupswitch instead of a tableswitch. Not the answer you're looking for? Browse other questions tagged java performance assembly compiler-construction switch-statement or ask your own question. access to a block in a switch statement in Java is Direct? What is the relative performance difference of if/else versus switch statement in Java? How to see JIT-compiled code in JVM? Difference between JVM's LookupSwitch and TableSwitch? Does switch case order affect speed?